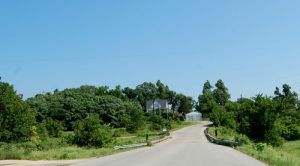 Located less than a mile north of Galena, Kansas on the other side of Short Creek, the townsite of Empire City was established on 120 acres that was formerly a farm owned by J. Nichols. 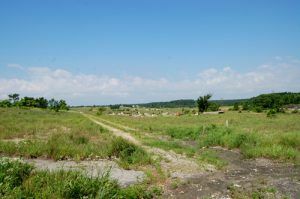 This tract, along with 580 more acres were purchased by the West Joplin Lead & Zinc Company for mining operations and a “company town.” Solon. Cheeney, Pat Murphy, and former Kansas governor, Samuel Crawford. As in the case of Galena, the excitement engendered by the lead discovery, produced an immense in pouring of people, wishing to secure their fortunes in these new fields of mineral wealth. As a natural result, the advancement of the town, both in its population and business, was extremely rapid. Long rows of houses, and blocks of business, went up simultaneously. 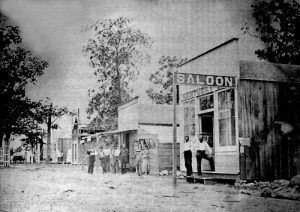 Empire City was incorporated as a city in June, 1877, a post office was established in July, and by the end of the summer, the town boasted some 3,000 people. For a time, a heated spirit of rivalry was carried on between Empire City and Galena, each keeping pace with the other, and seeking to excel in the race. The natural advantage was with Galena, since the majority of the richest lead field lay beneath and near the town. No sooner was this fact discovered, than Galena began to take the lead of Empire City. This change soon began to seriously discomfit the Empire camp, who strove arduously to turn the tide, and save themselves from being entirely absorbed. With all the friction, the prospect of keeping order in the two mining camps was not a very promising one. The quarrel assumed a serious aspect when Empire City decided to stop their population from moving over to the Galena side by building a stockade. On the night of July 25, 1877, the city council of Empire passed a resolution ordering a stockade eight feet high and one-half mile in length to be built along the south side of their city. If the plan was carried out, it would virtually stop all communication between the two cities and hinder public travel. The stockade was to enclose the south end of Columbus Street and the bridge over Short Creek. As the stockade began to be built, it created such a ruckus that the workmen were given police protection while building the wall. Galena residents protested in vain, petitioning the city, which, in turn appealed to the U.S. Government to prevent the closing of a public highway to the U.S. mail. However, as the gap was being closed and the action of the federal government was too slow, the Galena Mayor, acting under the authority of the city council, organized a posse of fifty citizens to prevent closing the gap. On August 15, 1877 at 4:00 am, the posse attacked, tore down, and burned the greater portion of the wall. Empire City, not anticipating the surprise attack, was unprepared, which resulted in the exchange of only a few shots and very little bloodshed. For several years, the two towns continued to vie for dominance with constant feuds between the residents, becoming so intense that doctors and undertakers began working nights and sleeping during the days. Despite the violence and illicit activities, Empire City continued to build, with most of its businesses houses located on Columbus Street. A newspaper called the Mining Echo was established in the fall of 1877, but it would only circulate for three years. The first school was taught in the winter of 1877-78 and a one-story frame building, containing three rooms was built in 1879. Two church groups were organized including the Presbyterians and Catholics. A small frame building was built by the Presbyterians in 1879. A Catholic Church was constructed in 1881. 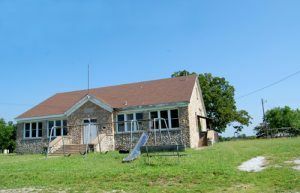 Though Empire City had already been annexed to Galena, the Roosevelt School was built in 1937 by the Works Progress Administration. By the early 1880‘s population of Empire City was over 1,000 and there were more than 300 students being taught in the school. By 1886, the city’s population had evidently dropped as its post office was closed in June. However, it reopened the next March. However, by the end of the 19th Century, the ore was depleted and the mining interests dwindled, along with the population. Finally, the dispute between Galena and Empire City entered the courts and after a long period of litigation, a truce was declared between the two cities, which, at last, began to work together in building one of the best mining camps in the world. When Empire City became a suburb of Galena on July 9, 1907. The surrender of her rights as an incorporated city to Galena was made amid great rejoicing, and pieces of the old stockade were taken away as souvenirs by citizens of both settlements. Empire City was annexed into Galena as its Fifth Ward in 1910. The town’s post office closed its doors forever in October, 1913. 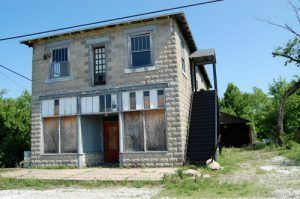 The Empire City no longer officially exists, there are still numerous homes and a couple of historic buildings left in the once thriving community.